Cambridge Audio 500 review | What Hi-Fi? 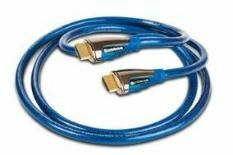 Not all HDMI cables are the same, proclaims the blurb on the new 1.5m-long 500-series HDMI from Cambridge Audio. Yet search the web, and you'll find many forum posters disagreeing, arguing that one HDMI is much the same as any other, and that by implication, high-end leads are a waste of cash. Us? All we can go on is the evidence of our eyes and ears, and the Cambridge Audio's picture and sound performance is so obviously superior to a free (or very cheap) HDMI that we find it hard to believe you could fail to notice the difference. Edges are sharper, colours appear more rich, black areas of the screen are denser and more consistent – even motion seems more convincing. Sound is better too, with clearer definition in the surrounds and more punch. Only one thing stands between the 500-series and five stars: the Chord Company SuperShield is better, and costs only £10 more.